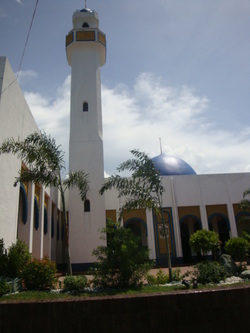 One of the landmarks of Taguig is the Blue Mosque. Located at Maharlika Village, it is a religious center for both Filipino and Muslims here in Maharlika. It was designed by famous Architect Angel Nakpil. Do you know what a Mosque is? A mosque is a sacred place where Muslims do worships and prayers. Muslims are obliged to pray five (5) times a day: morning, midday, afternoon, sunset, and evening. A mosque is also a place where they held their gatherings like Eid'l Fitr, which is celebrated during the month of Ramadan. A wedding can also be held at a Mosque. The word Mosque is derived from a word which means “place of prostration”. That's why Muslims bow their heads when they pray. Traditionally, men and women worship separately. Therefore, there is a provided room for them. One of the main features of a mosque is the minaret, a tall tower which every Mosque must have. It allows the “muezzin”, a chosen person who leads the “adhan” or call to prayer, to be heard by Muslims, and lead the worshipping at Friday services and the five daily times for prayer. Another feature of a mosque is a dome. It is situated on the top of the roof and it symbolizes the universe. 1. Muslims believe in one God, whom they call “Allah”. He is the only true God. 2. They believe in the existence of the angels. They are honored creatures. 3. They believe that God revealed books to His messengers as proof for mankind. 4. Muslims believe that all the prophets and messengers of God were human beings. Want to know what was the only word I said when I saw the place? “WOW!” Going there is a really tiring yet worthy experience. All my exhausted feeling was washed away. But unfortunately, I can’t enter the Blue Mosque because its management has an order that every woman must wear a “Hajib” when entering the Mosque. Hajib is a head cover for women. Since I can’t enter the place, I just took pictures from the outside. Just click the "SNAPS" button on the left side of your screen. THANK YOU.